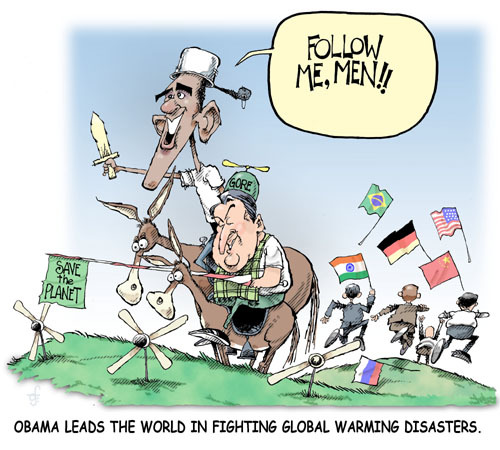 Obama’s global warming policies have few US followers – and fewer on the global stage. The President and Al Gore are certainly ready to lead. But how many will follow? Even in America, and certainly on the world stage, the two increasingly look like Don Quixote and his faithful squire, Sancho Panza. As they tilt for windmills, and against a “monstrous giant of infamous repute” – climate disasters conjured up by computer models and Hollywood special effects masters – their erstwhile followers are making politically correct noises, but running for the hills. The House of Representatives passed a 1400-page energy and climate bill – by a razor-thin margin, and only after Nancy Pelosi and Henry Waxman packed it with enough last-minute deals to protect favored congressional districts, buy votes, and curry favor with assorted special interests. Not one legislator actually read the bill – which would create a trillion-dollar cap-trade-and-tax industry, ensure that energy and food costs “necessarily skyrocket,” kill jobs, and impose an all-intrusive Green Nanny State. Republicans want to control what people do in their bedrooms, insists the old canard. Democrats, it appears, want to dictate what we do everywhere outside of our bedrooms. And Sancho Gore wants to become the world’s first global warming billionaire, by selling climate indulgences, aka carbon offsets. The reaction has been predictable – by anyone except House and White House czars and czarinas. Citizens are livid over yet another attempt to use a purported crisis to justify further expanding the government and spending billions more tax dollars for alarmist research, activism and propaganda, just ahead of the Copenhagen climate conference. Global warming continues to rank dead-last in Pew Research and other polls that actually list it as an issue. Rasmussen puts the President’s approval ratings at 46% and falling. Zogby reports that 57% of Americans oppose cap-and-trade bills. Manufacturing states, which get 60-98% of their electricity from coal, worry that the only thing they’ll export in ten years will be jobs. Democrat senators from those states worry that the energy and climate issue will be “toxic for them during midterm elections,” says Politico magazine. Even companies that had eagerly sought seats at the negotiating table are now gagging. ConocoPhillips, Caterpillar and others finally realize that cap-and-tax will severely penalize them and their customers. Not even the climate is cooperating. Outside of Dallas, 2009 has brought some of coldest summer days on record across the US. Near freezing temperatures nipped at crops, and gas heaters were sine qua non at an August 29 outdoor wedding in Wisconsin. The Farmers Almanac predicts a brutal 2009-2010 winter. In Europe, every longitude has a platitude about saving the planet. But EU countries that agreed to slash greenhouse gas emissions below 1990 levels are well above their Kyoto Protocol targets – Austria by 30% and Spain by 37% as of 2008. And despite new commitments to cut emissions 40 years from now, you don’t need tarot cards or entrails to predict the more probable EU emissions future. Germany plans to build 27 coal-fired electrical generating plants by 2020. Italy plans to double its reliance on coal in just five years. Europe as a whole will have 40 new coal-fired power plants by 2015, columnist Alan Caruba reports. The Polish Academy of Sciences has publicly challenged manmade global warming disaster hypotheses. And only 11% of Czech citizens believe rising carbon dioxide emissions caused global temperatures to climb 1975-1998 – and also caused them to rise 1915-1940, fall 1940-1975, then stabilize and decline again 1998-2009. Australia just voted down punitive global warming legislation. New Zealand has put its emissions-bashing program in a deep freeze. Russian President Dmitry Medvedev’s top economic aid bluntly dismissed any talk of following President Obama’s quixotic lead. “We won’t sacrifice economic growth for the sake of emission reduction,” he told reporters at the July 2009 G8 meeting. Chinese and Indian leaders are equally adamant. China is playing a smart hand in this high-stakes climate poker game, drawing up plans to combat global warming sometime in the future, and gradually improve its energy efficiency and pollution control. However, it is building a new coal-fired power plant every week and putting millions of new cars on its growing network of highways. India and China have a “complete convergence” of views on these matters, Ramesh added. No wonder: 400 million Indians still do not have electricity; 500 million Chinese still do not. No electricity means no refrigeration, to keep food and medicines from spoiling. It means no water purification, to reduce baby-killing intestinal diseases. No modern heating and air conditioning, to reduce hypothermia in winter, heat stroke in summer, and lung disease year-round. It means no lights or computers, no modern offices, factories, schools, shops, clinics or hospitals. Fossil fuels are “gradually eliminating poverty in the Third world,” observes UCLA economist Deepak Lal. Any call to curb carbon emissions would “condemn billions to continued poverty. While numerous Western do-gooders shed crocodile tears about the Third World’s poor, they are willing to prevent them from taking the only feasible current route out from this abject state” – oil, gas, coal, nuclear and hydroelectric energy development. The situation is intolerable, unsustainable, lethal and immoral. The only way India and China would agree to cut their emissions is if the United States cut its emissions 40% by 2020, says Ramesh – back to 1959 levels and pre-JFK living standards, when the US population was 179 million (versus 306 million today). No way will that happen. So Asian energy and economic development will continue apace. And rightly so, to foster human rights and environmental justice. All is not bleak, however, for Canute Obama’s impossible dream of controlling global temperatures. British politicians remain committed to slashing CO2 emissions and replacing hydrocarbons with wind power. Unfortunately, the biggest UK wind projects have been abandoned or put on indefinite hold – and a growing demand/supply imbalance portends still higher energy prices, widespread power cuts, rolling blackouts and energy rationing, the Daily Telegraph reported on August 31. Brits may soon trade their stiff upper lips for contentious town hall meetings and ballot-box revolution. The Democratic Party of Japan’s landslide victory in the August 30 election will likely create a new coalition government tilted strongly to the left. The DJP has pledged to cut carbon dioxide gas emissions 25% below 1990 levels by 2020 – though this will likely strangle economic growth and job creation, especially if one coalition partner’s opposition to nuclear power becomes DJP policy. Then there is Africa, where leaders appear ready to support curbs on energy use – in exchange for up to $300 billion per year in additional foreign aid, “to cushion the impact of global warming.” That will be nice for their private bank accounts, but less so for Africa’s 750 million people who still don’t have electricity. Those people will simply be sacrificed, to prevent natural or fictitious climate disasters. Of course, the real goal was never to control the climate. It was always to control energy use, lives, jobs, economies, transportation and housing – and usher in a new era of high tax global governance. The American people are increasingly saying they’re not ready to grant that power to Obama Gore & Company.